related portals: Christianity, Ecumenical Councils, Pre-Nicene Christianity, Post-Nicene Christianity. related authors: Constantine, Arius, Alexander of Alexandria. 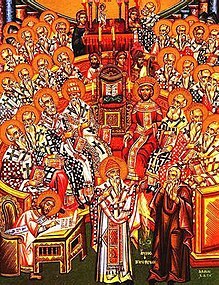 The First Council of Nicaea (Greek: Νίκαια) was a council of Christian bishops convened in Nicaea in Bithynia by the Roman Emperor Constantine I in AD 325. This first ecumenical council was the first effort to attain consensus in the church through an assembly representing all of Christendom. The First Ecumenical Council, translated by Philip Schaff et al.